The flat amount coverage option is typically used for Basic Life or when there is only one offered coverage amount available. 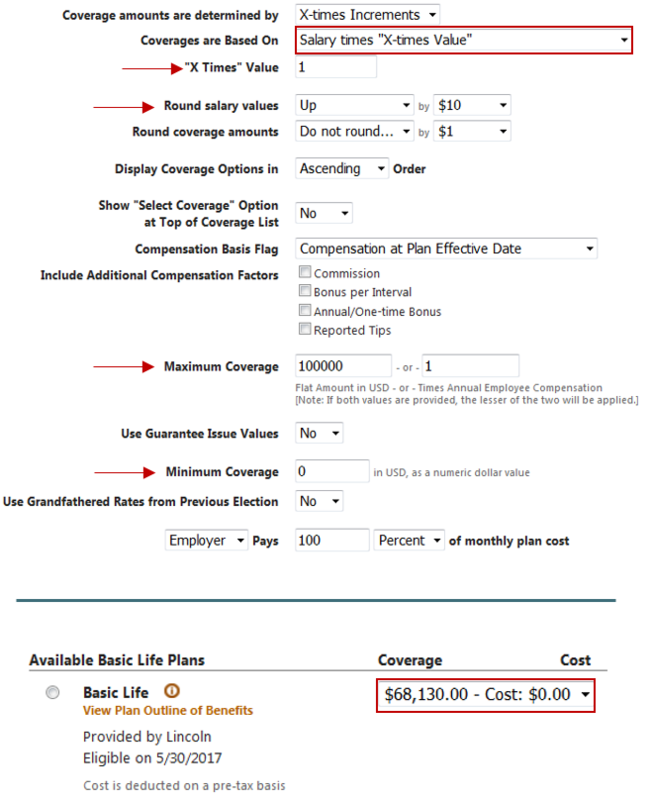 The example to the right illustrates the proper way to set-up a life plan that is 100% Employer Paid using the Flat Amounts coverage option. Please note that the “Use Guarantee Issue Values” toggle has been set to No because underwriting is not required, and the Minimum Coverage field has “0” entered. This is to ensure that the reduced coverage amounts, due to age reductions, will be applied as necessary. 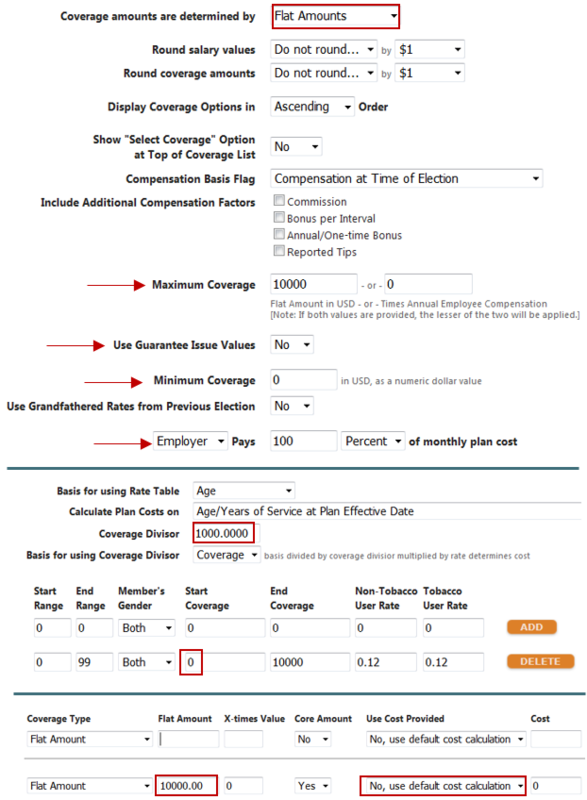 The employer rate should be entered on the Age Rates page as a rate per 1,000, and again, the Start Coverage amount should be “0” for age reduction purposes. Additionally, when you use the flat amount coverage option you will be prompted to enter the Offered Amount in the subsequent set-up page. You do not need to enter the cost for the flat amount offering because we will be using the default cost that was entered on the age rates page. The “X Times” Value field is where you enter the multiple of the salary that is being offered. Please note: if the plan rules require the salary based coverage amount to be a whole number, you will want to be sure to enter the specific salary or coverage rounding rules as well. If coverage does not need to be rounded, then leave the rounding values at their default settings of “Do not round”. Ifunderwriting will be required for enrollments that are made outside of the new hire enrollment window, be sure to turn “Use Guarantee Issue Values” toggle to Yes, and only enter the new hire GI amount. OE GI values should be “0”. This option is used when coverage is offered in increments of employees salary, up to a maximum multiple value. The “X Times” Value field is where you enter the max multiple of the salary that is being offered. 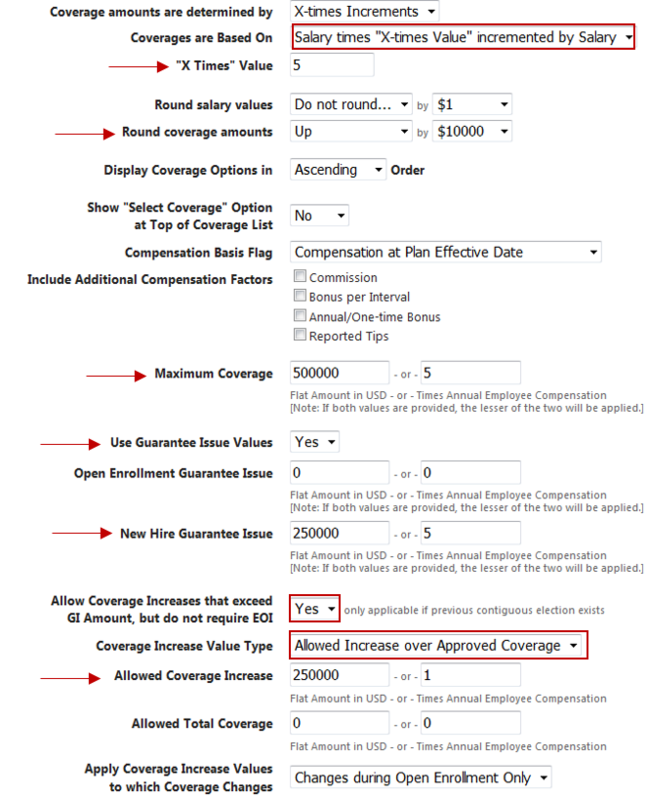 Please note: if the plan rules require the coverage amounts to be a whole number, you will want to confirm with the carrier if the salary orcoverage amount should be rounded as it will impact the incremented coverage offerings. In the example to the right, the employee can elect up to 5x their salary, not to exceed $500,000, and the coverage amounts are rounding up to the nearest $10,000. If the employee’s annual salary is $68,124.58, the coverage offerings would be 70k, 140k, 210k, 280k or 350k. 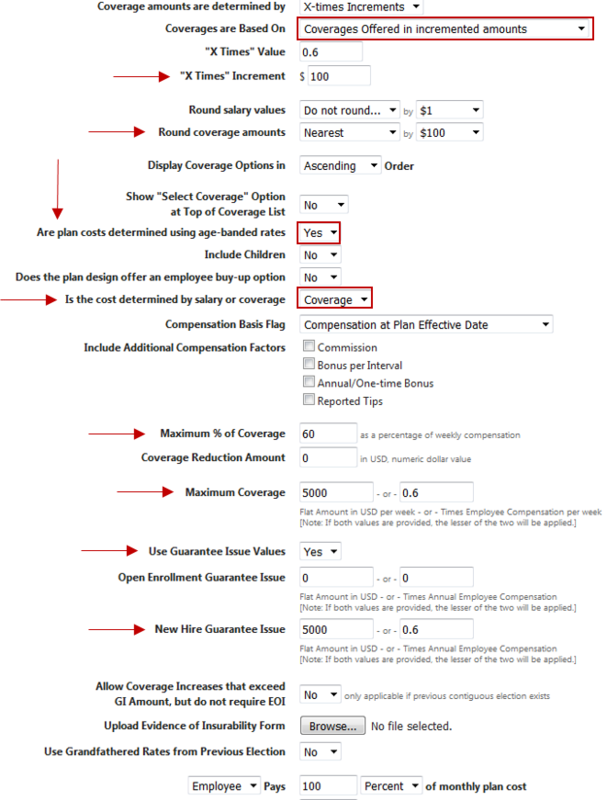 Additionally if the carrier allows coverage increases during OE for those with existing coverage, you would mark the option for “Allow Coverage Increases that exceed GI Amount, but do not require EOI” to Yes, and select the appropriate coverage increase rule from the drop down options and enter the allowed increase values. This option is used when coverage is offered in incremented amounts, not based on salary. The “X Times” Increment field is where you enter the incremented amount that coverages are offered in. Please note: if the max coverage available is a flat amount, not to exceed a multiple of the employee’s salary, you will need to enter coverage rounding rules to ensure that max offering, if based on the employees salary, is in the correct incremental amount. In the example to the right, coverage is offered in increments of 10k, to a max of 500k, not to exceed 7x the employees salary. If the employee’s annual salary is $68,124.58, the max coverage offering would be 480k, which is 7x the employee’s salary ($476,872.06) rounded up to the nearest 10,000. 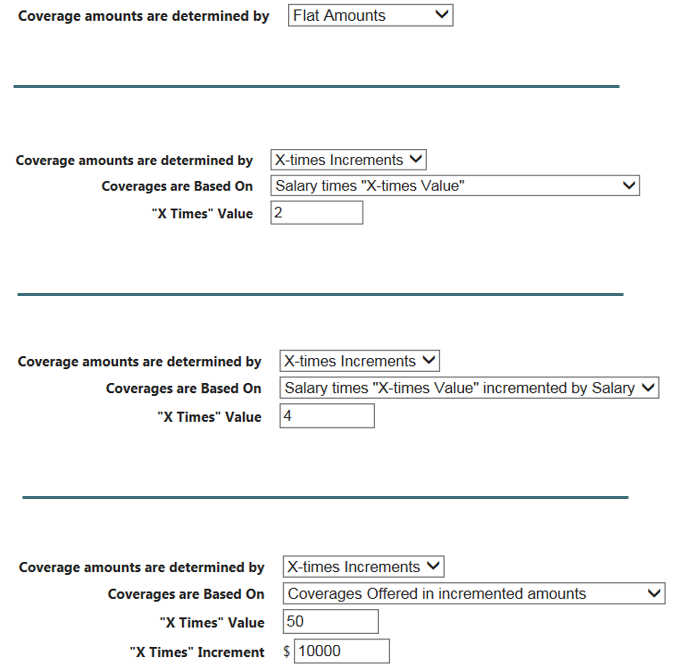 The most common setting is X-times Increments, with coverage based on Salary times “X-times Value” (0.6 x monthly or weekly compensation). If the disability plan is a voluntary benefit you can use the option to have Coverages offered in incremented amounts, up to a max percentage of the employees monthly or weekly compensation, as long as you have been provided with age-banded rates per 100 for LTD or per 10 for STD. The “flat amounts” option is not typically used for disability plans unless coverage is offered in incremented amounts and the carrier is not able to provide a rate per 100 or. In this case each offered amount would have to be entered with its own unique cost. This is not recommended. This option will always be used for LTD and STD plan builds when the benefit is 100% employer paid. 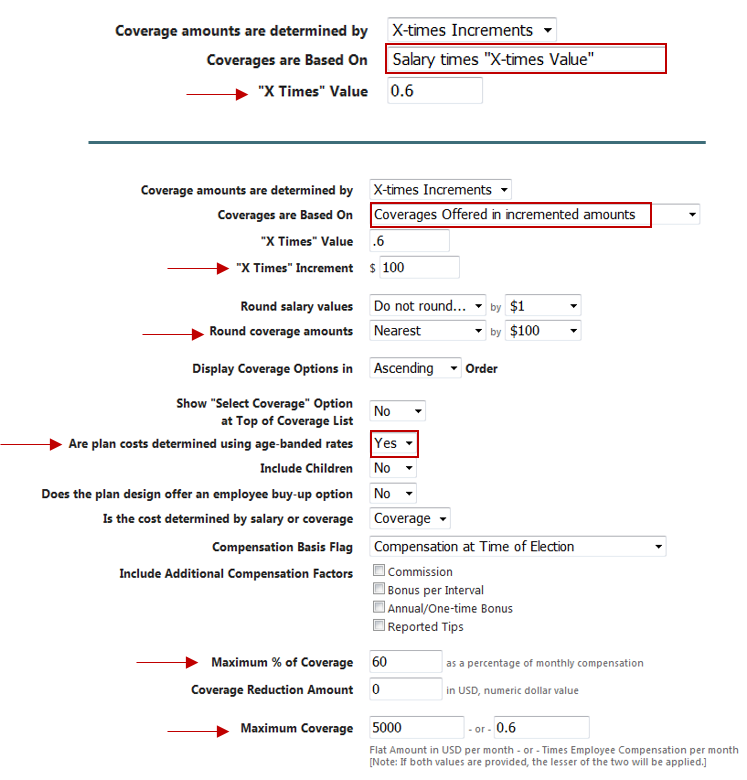 Coverage is typically always 60% of the employee’s monthly (for LTD) or weekly (for STD) compensation and you will enter the percentage of compensation in the “X Times” Value field. For LTD, the cost is typically always determined by the employees full monthly compensation and not the coverage amount. 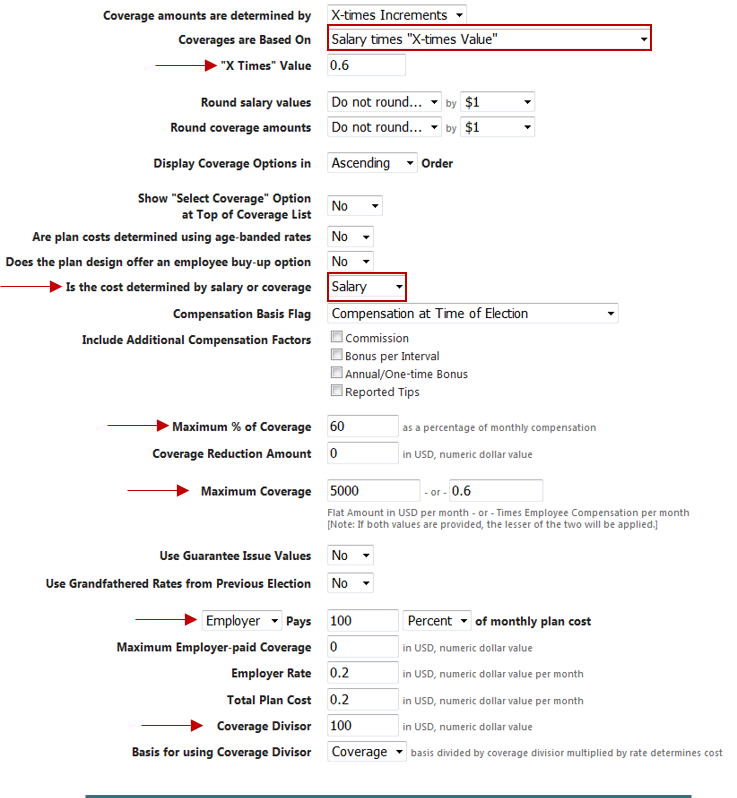 You will need to make sure you set the toggle for “Is the cost determined by salary or coverage” to Salary. For STD, you will leave the toggle set at Coverage. To get the monthly cost for the LTD benefit, take monthly compensation / coverage divisor x rate. To get the monthly cost for the STD benefit, take the coverage amount (annual salary / 52 x .6) / coverage divisor x rate. Voluntary disability plans typically offer coverage in incremented amounts up to a max percentage of the employees monthly or weekly compensation. 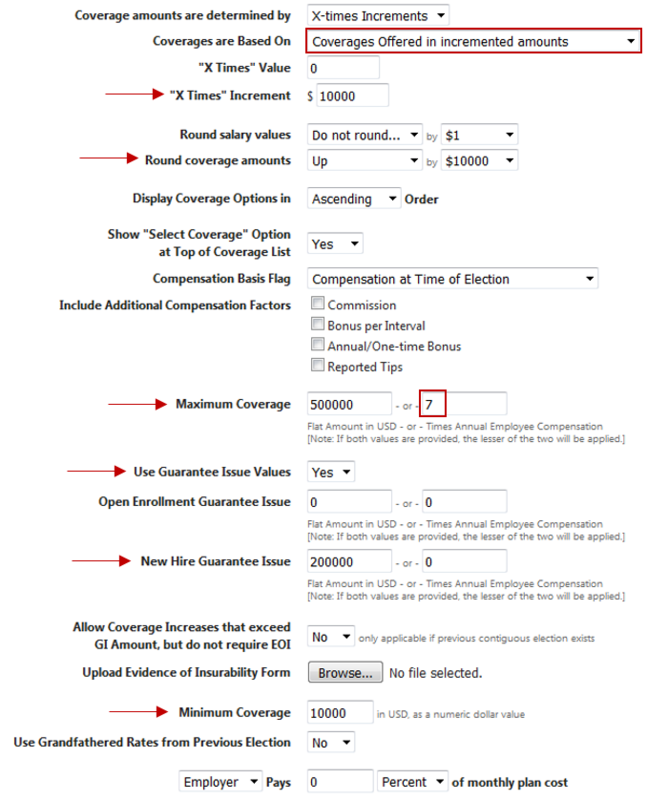 Enter to increment amount that coverage will be offered in, in the “X Times” Increment. Please be sure to the enter coverage rounding rules to ensure that the max offering is in the correct incremental amount. In order to enable the option to enter the age rates, you will need to change the toggle to Yes at the field that asks “Are plan costs determined using age-banded rates”. For Voluntary Disability plans the cost will be determined by the coverage amount. Leave the default setting for “Is the cost determined by salary or coverage” at Coverage. Maximum % of Coverage needs to be entered as the whole number (60%). The Maximum Coverage will be the flat monthly or weekly amount -or- the max percentage of compensation. The system will apply whichever is less. The example to the right is a common set-up for a Voluntary STD plan, with coverage being offered in increments of 100, to a max of 5,000, not to exceed 60% of the employees weekly compensation. If the employee’s annual salary is $68,124.58, we can determine that 60% of the weekly compensation would be $786.06 (annual salary / 52 x .6) and therefore the coverage offerings for this employee would be from $100 to $800.